Make easy work of hard cleaning with iRobot Braava 390t, the best floor mopping robot. Mopping floors is a back-breaking chore - literally! And messy to boot. Not anymore. 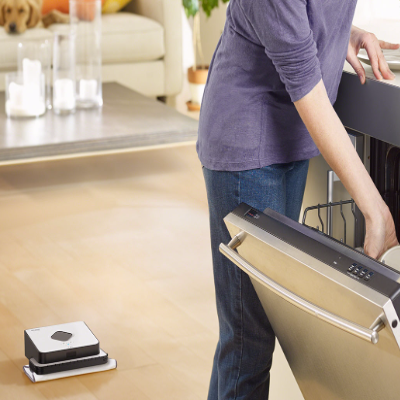 Braava uses dry or damp cloths to clean up the dirt, the grime, the dust and the smudges, at the press of a button. 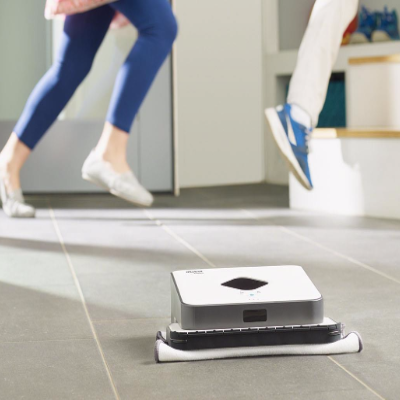 The iRobot® Braava® 390t is the mopping robot for multiple rooms and large spaces*, providing hassle-free mopping and sweeping to tackle everyday dirt and grime. Braava® 390t helps you maintain gleaming hard floors, every day, the easy way - dry or damp-mopping any hard-floor surface with disposable or microfibre cleaning cloths. Designed to mop floors quickly and efficiently, Braava 390t systematically covers your entire floor in a single pass. Reservoir Cleaning Pad dispenses liquid during the cleaning cycle, continually refreshing the microfibre cloth with fresh fluid. Retains a map of its cleaning space while powered on so you can replace the cloth mid-cycle without missing a spot. 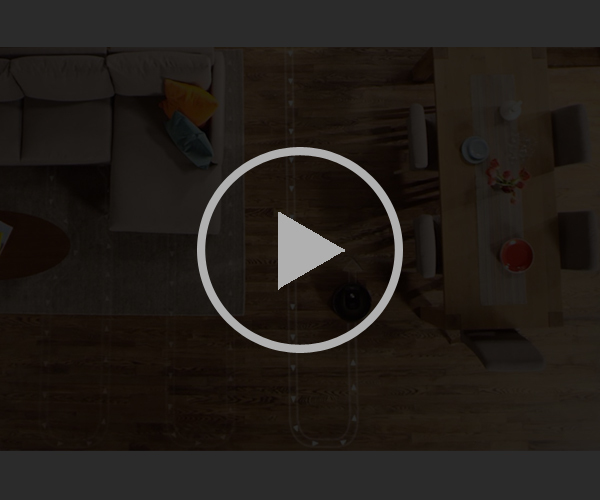 Braava’s shape and navigation system enable the robot to cover the entire floor. Cleans dust and dirt along walls, skirting boards and edges. Avoids area rugs and raised transitions to carpets. Braava 390t dry or damp mops your hard floors to tackle daily dust and dirt, leaving a gleaming finish. It’s so easy to use…just attach a cloth, put Braava down, press a button and off it goes, using advanced robotic technology to track where it’s been and where it needs to go. Braava 390t works on hard-surface floors, including tile, vinyl, hardwood, and laminate. Braava 390t cleans multiple rooms with its iAdapt 2.0 navigation system using NorthStar® cubes, including under furniture while avoiding stairs and other drop-offs. The Turbo Charge Cradle provides sleek, compact storage and charges Braava 390t in just 2 hours. Cleaning cloths are easy to attach and remove with the removable magnetic multi-purpose cleaning pad. Attach a cleaning cloth, put Braava down and select a cleaning mode. Quiet enough to operate without disrupting your daily activity or sleep. When finished cleaning, Braava returns to where it started and powers down automatically. Dry mops for up to 210 minutes (up to 93 m2) using dry cloths to pick up dust, dirt, and hair. Damp mops for up to 2.5 hours (up to 33 m2) using special mopping action and damp cloths to lift surface dirt and grime.